Tears came down my eyes when I saw the destruction the earthquake in Haiti caused. Haitians, already deeply impoverished, had their luck worsen by one of the most devastating natural disasters witnessed in our lifetime. Port-Au-Prince, the capital, was destroyed. 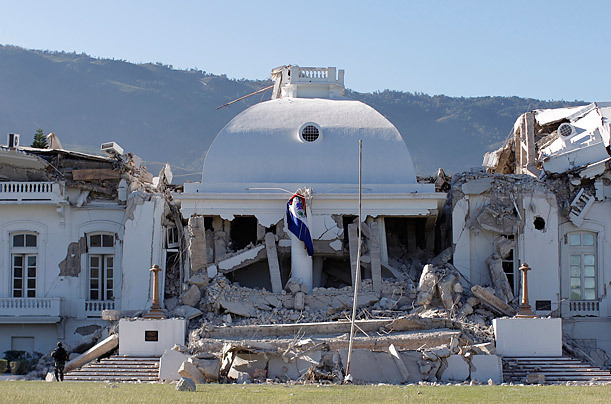 The Haitian White House, the home of the president, gone. This was symbolic that the earthquake decimated both rich and poor. The earthquake did not play favorites. Mothers cried as they desperately searched for their children, just as other children sat hopeless with no guardian in sight. Hundreds of thousands died, and hundreds of thousands more were displaced from their tiny, fragile homes. This disaster, although happening in the "third world," reminded me of an event that happened here, in the United States, the most prosperous nation in the world: Hurricane Katrina. The chaos, the devastation, the panic is all the same. The government in Haiti, just as in the United States, was underprepared. The Haitian President, visibly shocked, begged for help from the International community, recognizing that resources were not available and that he too was homeless and helpless like the very people he pretended to serve. Oh, the irony in this world. Fascinating how life works. Mysterious no doubt, but precious nonetheless. One good sign is that it appears help is on the way. Food and medical supplies are being delivered, although the rate still seems too slow. One reason for this, according to reports, is the lack of infrastructure, particularly destroyed ports and having only one small airport in Port Au Prince. That is of course an issue, but desperate Haitians still await, injured, hungry, scared, and traumatized. Not all wounds will be healed, but let's try our best to stop the bleeding.